What kind of people do we need here in Swaziland? Maybe it’s YOU? Thank you all for your prayers for Ian’s health last week. We spent most of the week in Johannesburg and got great news at every step. The Doctor in Swaziland and the Cardiologist in South Africa both seemed to think that Ian would come out of the Angiogram with a Stent in one artery. Ten minutes into the procedure the Cardiologist came out and said, “His heart is perfect! But now we much check his lungs because there must be something there. Come back tomorrow and we will do an x-ray”. A few of the things that were thrown around included Tuberculosis (well, duh, we have lots of exposure to that), lung cancer and a few others that I didn’t understand. The next morning the lung X-Ray was perfectly clear and the Cardiologist just shook his head. He said that Ian’s stress test and symptoms were classic cardiac, but he seems to be in perfect health. We then wondered if the Blood Pressure medication that Ian was on in Georgia (because of the high stress of our last year there) should/could have been reduced once we moved and his stress was lowered. Of course he hasn’t been to see a Doctor in two years so he has been on the same medication. Maybe his BP was normal and the medication was pushing it too low causing weakness, tiredness, shortness of breath etc. He is now off all medication and feeling good so far. We claim this as a healing and give thanks for the Great Doctor, El Rofi, who made Ian and has His mighty hand on Ian’s life. Now for this weeks blog. In February we had a great meeting in Swaziland with several of our Board members and staff called the 2014 Heart for Africa Business Summit. There were many things on the agenda, but one of them was what does Heart for Africa Swaziland need in the area of Human Resources that could be filled by volunteers from abroad. Animal Husbandry Expert – specifically goats, chickens, dairy cows. House Grandmother/Grandparents for Labakhetsiwe Toddler Home – a mature woman or couple who would come and live at the Toddler home (with dozens of loud and beautiful children) who can help serve as a Grandmother or Grandparents to the children for one year or more. Pastor with a focus on Children’s Ministry. One of our key focuses at Project Canaan is to hire local Swazi’s so we are very sensitive to bringing in people from abroad. That being said, we do know that volunteers, with specific areas of expertise and gifting can be a huge asset to everyone at Project Canaan. If you are interested in getting more information about these positions please send a letter of interest to info@heartforafrica.org and tell us all about yourself, your background, why you would like to come and serve as a volunteer and include a Resume if possible. We have an extensive Long Term Volunteer application process, but it can go faster if you have traveled with us in the past. We are looking for people who have a heart to serve the Lord through serving others. We are looking for Followers of Jesus, who are flexible, flexible and adapt easily to change J. Next week we are working on finalizing the development plan for Project Canaan Phase Two: The Road to Sustainability. This will be presented to our Board of Directors at our Annual Board Meeting in mid-April and then at two events in Georgia at the end of April. If you are interested in coming to visit Ian and I and seeing how you can be a part of this exciting plan (even without moving to Africa!) we will be speaking during the evenings of April 28th or April 29th. Please email tricia@heartforafrica.org for details. Live from Swaziland … I am thankful for an amazing week. Labels: Ian, Phase Two: Road to Sustainability. 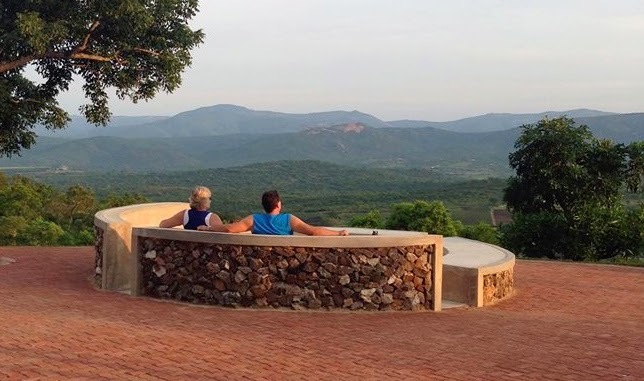 Ian's heart update - taking it easy in Swaziland. Today is a quiet day at Project Canaan. It has been quiet for the past three weeks since we first thought that Ian had had a heart attack and rushed him in to a hospital in town. The good news is that it was not a heart attack, but a warning to seek medical attention. After three weeks of attempting to get a Stress Test done (rivers flooded, Doctors not available etc) he finally got it done this past week. The results were not what we had hoped and he has been diagnose with Ischemic heart disease, (Right Coronary Artery Inferior Wall). We are going to Johannesburg, South Africa on Monday to see a Cardiologist for an Angiogram on Tuesday. So these days we are laying low, staying still and being quiet while enjoying our new puppies (Sadie, Sam, Georgia and Thai). We are thankful for so many people have offered to help us through this time of uncertainty and unrest. Amber and Kenny are helping with our dogs (now 2 adults and 4 puppies) by getting their shots next week and stay with them all at the house. Anthony came by this morning to help with some gardening and landscaping things we had planned (like planting dwarf-banana trees at our house!). I know that many people think that this is a stressful job, but I want to say that we live in a place of peace here on Project Canaan. Is it easy? No, of course not. But it is not nearly as stressful as our past life in marketing or our time living in Georgia running Heart for Africa US and Canada and we LOVE our calling here in Swaziland. This is a wonderful place and we give thanks everyday for the view, the peace and the joy that is found here as well as the people we serve with. The highlight of each week for us is to get on our ATV’s and driving around the whole farm to see all that has happened during that week. I have attached photos for you to get a glimpse of what we enjoyed seeing this week. 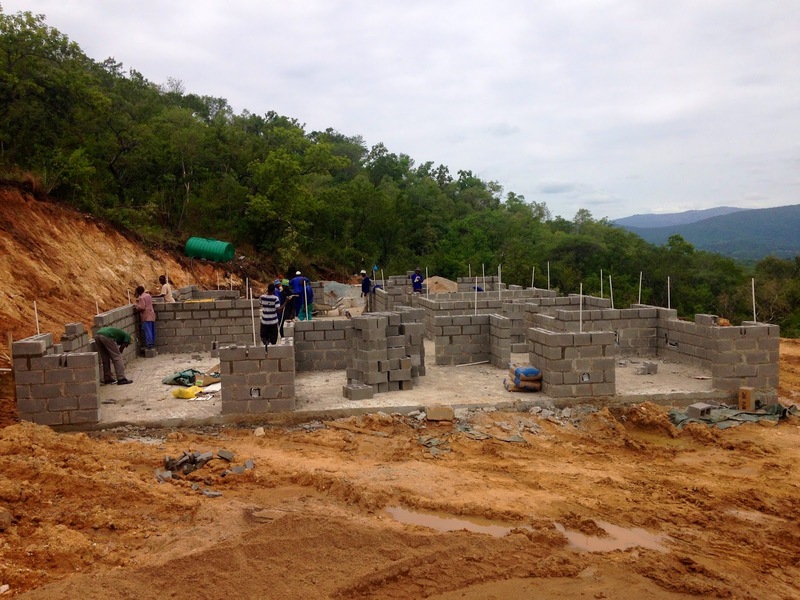 The Kindergarten walls are going up, the banana trees are growing in the field and will bear fruit this year, the land has been cleared for 200 Dragon Fruit plants and we have 6 hectares (12 fields) planted under drip irrigation with Baby zucchini, Patty Pans, Baby Corn and Green Beans. We have four cows being milked now and another 20+ pregnant cows are on the way in the days ahead. 150+ goats roam the fields and provide meat for our children and some partner churches. It’s all so awesome there are no words to explain what we feel. That being said, we need to get Ian’s “ticker” checked and fixed. So for now, we rest. Thank you all for your prayers. Please know that we have total peace about all of this and we know that we are securely in His mighty hands. This is just a part of the adventure and we look forward to seeing how the Lord uses it for His glory. He wastes nothing. Live from Swaziland … we are having a lovely quiet day. PS - as I was writing this I got stung in the forehead by a something that felt like a nail being hammered in to my head. I didn't see the insect, but I think it was the size of a horse based on how my head is aching. OUCH! What does Ian's Google Search History say about him? It’s Saturday again and the sun is shining. The river has receded and it can be crossed safely again after seven days of being “stuck” on the mountaintop. Oh, to be stuck with this beautiful view. The last few blogs have been pretty heavy with heart problems and the death of a baby so I thought I would try to provide some levity this week by sharing with you a little of the “behind the scene” in the life of Janine and Ian Maxwell. Last week I was called by Social Welfare to rush over to their offices and pick up a one-month old baby whose mother wanted to kill him. She threatened on three occasions, including in front of the police that she was going to kill the baby so I was asked to take the baby to safety. Those are not easy days, nor are they quickly forgotten. After Ian and I got home that day I was about to do a Google search for the Psychiatric Hospital in Swaziland and up popped my Google Search History. I read back the last 10 Google searches I had done and actually laughed out loud. Then I asked Ian to read his to me. So here we go – a peek in to the real lives of Janine and Ian Maxwell. I think this is a funny and interesting way to look back at what each of us are searching for on the internet. What does your Google Search History say about you? A few of the toddlers want to say "hi"! Well, that’s life in Swaziland. We are thankful for Google and thankful for you. Live from Swaziland … we are enjoying the patio view. 8-month old Baby Emma's funeral - "Blessed are those who mourn"
Today we buried Baby Emma. She was 8-months old and died suddenly on Monday morning. She was reasonably healthy, HIV negative and a joyful baby. We knew when we opened the El Roi Baby Home and started accepting babies who were coming in sick that we would likely lose some, but we thought they would succumb to Tuberculosis, or another HIV related illness. We never expected SIDS (Sudden Infant Death Syndrome). 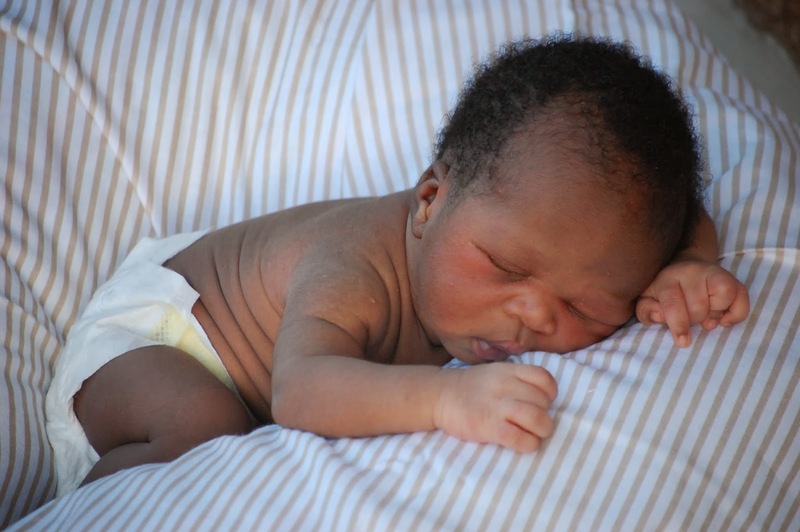 Children die of SIDS all over the world, and it is a heartbreaking, tragic and soul-crushing experience. My heart mourns with all who have lost a baby or a child in any way. My friend, Teresa Birk, buried her little Jared a few short years ago and it is in his memory that we built the El Roi Baby Home. It is strange, and yet awesome to think that Emma met Jared (and Solomon) this week in heaven. I wonder if Jesus is the one who introduced them? That a great greeting that would have been. It was a hard week for us, but a great week for Emma. One can never know the pain that a parent feels to lose a child, but we can find comfort knowing that we will be with them again in heaven. Please find below some photos that I took today, for you the reader. While I felt very awkward taking photos during the service, I know that there so many of you who were with us in spirit and prayer. May these photos bring you peace. The coffin is passed down to two Aunties to place on a grass mat and cover with another one. The men take turns shoveling dirt and packing it down. The women collect stones from the area to place around the grave. Emma's grave is next to Solomon's. Live from Swaziland ... it is time to rest. Ian's trip to a Swazi hospital with signs of a heart attack - Africa is not for sissies. On Wednesday morning Ian woke up and followed his usual early morning routine. That includes letting Jack (our Jack Russell who likes to sleep inside!) outside, letting the new puppies out of their gated area, taking Jack and Max up to their daytime living quarters (where they won’t eat a Swazi who might walk by), feeding/water the dogs, feeding/watering the chickens and letting them out of their coop AFTER he turns OFF the electric fencing and opens our gates for people to come in. The electric fencing keeps the dogs in and people out at night, but is off during the day so that we don’t have fried chicken all the time. This all needs to be complete before 7AM when people are here to see us. When he came back in the house he was dripping with sweat. Not unusual since it is so hot here right now. But he was very flush and said his chest felt like someone was sitting on it. Before he lay down on the bed to slow his heart down he took his blood pressure and it was a bit low (117/78), which is unusual for him. I brought him a glass of juice in case it was a random blood sugar drop, but that didn’t seem to help. After a while he got up and showered and prepared for his morning meetings. I left to go to my weekly meeting at the Children’s Campus and came back just before lunch. He said he still wasn’t feeling great, still feeling pressure and was really tired. The power had been out the night before we were sound asleep by 9PM, so I really didn’t think the “tired” was likely. I called Brooke Sleeper (our amazing and wonderful Nurse Practitioner) and handed the phone to Ian to answer her questions. He hung up and went back to his meeting. A few minutes later I received a text message from Brooke basically saying, “Give Ian an Aspirin and take him to the hospital for an EKG now, not this afternoon. I don’t want to scare you, but his symptoms are inline with a minor heart attack.” I got up, got an Aspirin and water, took it out to the patio where Ian was meeting with Kristal about payroll, gave it to him, asked him to please come with me, we are going to the hospital. That was that. Going to a hospital in Swaziland can be a terrifying experience. I am in hospitals 3-4 times a week, every week, and they are not a place you want to go as a patient. The hospital that we thought was “the best” in the country is the one who misdiagnosed Jimmy and John’s injuries only two weeks ago. They said John didn’t have a broken wrist, but he did. They said Jimmy had one broken rib and a cracked pelvis. When he arrived back in Missouri they found NINE broken ribs, one displaced rib that was sticking in to his liver, two cracks in his pelvis, two sprained ankles and more bruising. So, I really really didn’t want to go back to that hospital. Brooke called the other “good hospital” to see if they had an EKG machine and they assured her that they did. The only problem was that they didn’t have the right size paper to print on, so it was out of order. Kristal was in our back seat as we were dropping her home on our way and she mentioned a hospital that some of her new neighbors go to. We dropped her at her gate and within minutes she had texted us the number. We called and sure enough they had an EKG machine and so we headed there. We were totally surprised to find this private hospital inside the corporate offices for a construction company. We quickly learned that this hospital has an EKG machine, handles Trauma, has a lab, Life Support, Operating room and beds. Within a short time we met the Doctor who actually owns the hospital and he had Ian hooked up to the EKG machine and blood drawn in record time. In equally quick time, Ian found himself admitted to the hospital in the ICU ward with an IV in his arm and oxygen on while they took more blood to watch for his Cardiac Enzymes (to see whether he had or was having a heart attack). Of course Ian started to feel much better and even quoted Monte Python saying, “I feel like going for a walk!” He picked up his laptop and started back on payroll, which was to be paid the following day. As an aside, we have 217 employees at Project Canaan who get paid once a month. Each person’s hours/days are tracked manually, put in to a spreadsheet, deductions made and then each one gets paid in cash, down to the penny (or Lilangeni). It is a grueling process that Kristal is (thankfully!) helping take off Ian’s plate, but it was not off his plate for February payroll so there he sat, in ICU, doing payroll (which likely was part of the heart problem to start with). Yes, I had to take a photo. I digress. 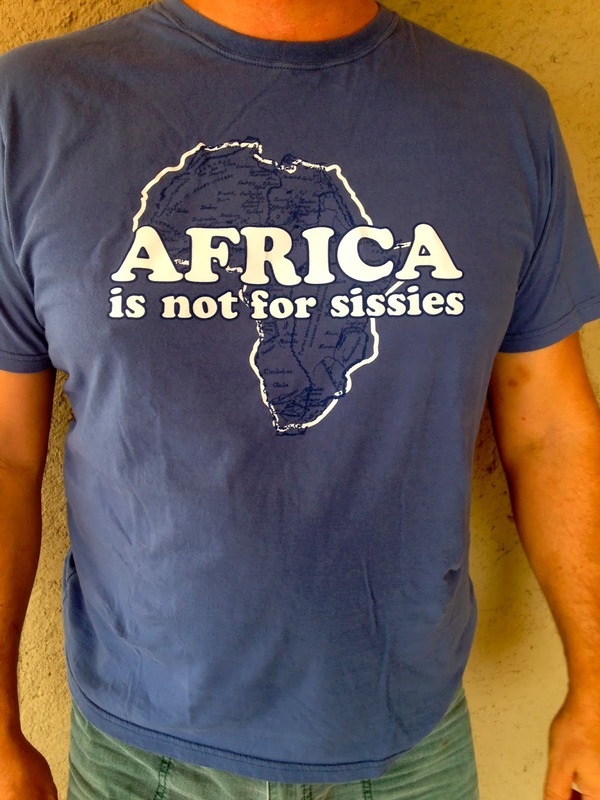 As Ian’s favorite t-shirt says, “Africa isn’t for sissies”. It’s hard. Everything about it is hard. Our children live in the US and Taiwan – how/when do I call them and tell them that their father may have had a heart attack? How do I comfort them or assure them from a million miles away in a hospital in a Third World Country? Following Jesus is not always easy, in fact, it is rarely easy and scripture warns us that people who followed Jesus didn’t always have easy lives (or die painless deaths). It is times like these that our faith is really put to the test. What do I really believe as I drive down a highway to an unknown hospital for unknown tests on my best friend and love of my life? That is the real question. I assure you that we are not Super-Christians (whatever that means), but we do believe with all our hearts (even ones in trauma) that the Lord has called us to be here. He will see us through, and that might not look the same to us as it does to Him. Luke14:25-27 (The Message Bible) says, “One day when large groups of people were walking along with him, Jesus turned and told them, “Anyone who comes to me but refuses to let go of father, mother, spouse, children, brothers, sisters—yes, even one’s own self!—can’t be my disciple. Anyone who won’t shoulder his own cross and follow behind me can’t be my disciple.” That is not an easy scripture to embrace is it? It doesn’t seem reasonable. The cost is too high. The next day, after Ian’s EKG and blood work was reviewed by a Cardiologist in South Africa (there are none in Swaziland), Ian was discharged with Aspirin, Beta Blocker, Nitroglycerin and an appointment to go back for a Stress Test. Maybe he dodged a bullet. Maybe the Stress Test will show the need to see a Specialist. Maybe this was all an early warning sign to us to make some changes in the stress levels of our lives. 1 Thessalonians 5:18 says, “give thanks in all circumstances; for this is God’s will for you in Christ Jesus”. I know that this may be easier said than done, but it is what we are commanded to do. 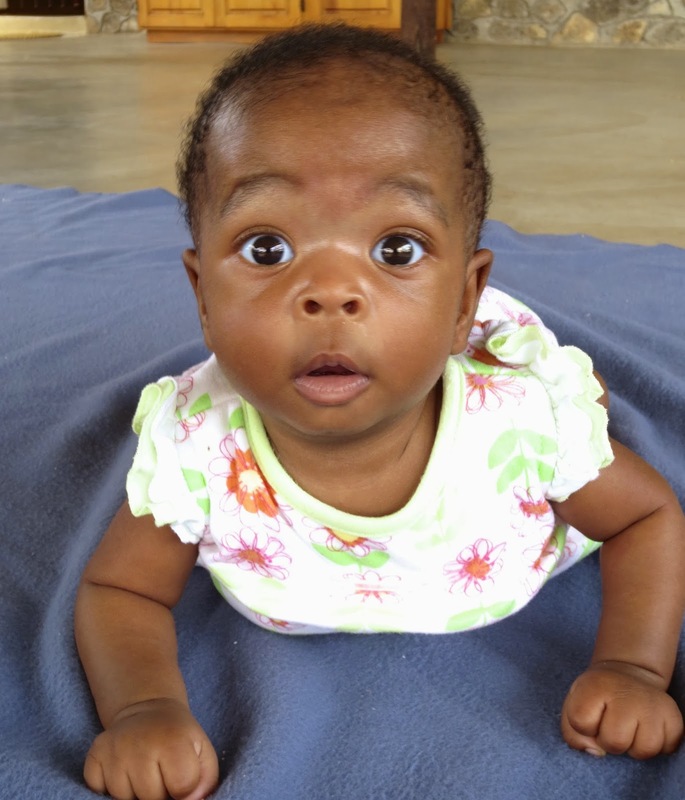 Speaking of giving thanks - it was two years ago today that the first baby arrived at the El Roi Baby home. His name is Joshua and while he arrived with Syphilis, Jaundice and a few other conditions, he was quickly attended to, fed and loved. Today he is happy, healthy and celebrated his second birthday yesterday with his 51 brothers and sisters. What if Ian had said “no”. I don’t want to move and leave my children, my family, my life. Where would Joshua and the other 51 babies be today? Only He knows. Live from Swaziland … we have much to give thanks for this week. PS – if you can be a monthly supporter of the children living at Project Canaan, please do so today. Every dollar helps us save a life. Thank you. Labels: Heart attack, Ian, Joshua.